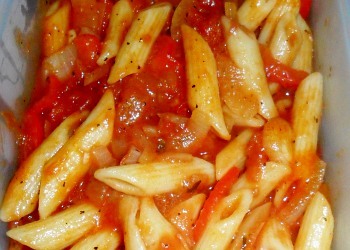 A simple pasta upon which you can build your own complexities. 250g (half a 500g bag) of Penne or whatever your favourite pasta is. use oregano instead of, or as well as the basil. use a green pepper instead of a red one. add sliced mushrooms once the onions have cooked. add chopped chillies when you add the pepper. when you add the chopped tomatoes, add some pulses such as butter beans or chick peas. Add some tomato puree or sun-dried tomatoes for a different flavour. In a large pan, add 1.5 litres of boiling water. Add the basil and let it boil for a minute to soak the basil. Add the oil and the pasta, put on the lid and bring to the boil. Once it is boiling, put it on a low light and let it simmer. Start making the sauce now and they should be ready about the same time. In another pan, add the oil, the basil and the black pepper. Heat up to release the herb and spice aromatic oils into the olive oil. Add the chopped pepper and cook for about 5 minutes. 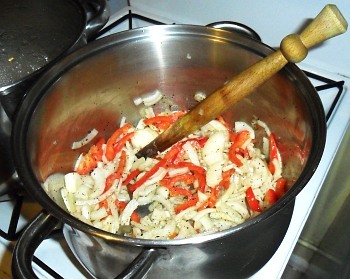 Once it has started to soften, add the onion and the garlic. Fry for a few minutes and then add around 50-100mls (2-4Floz) of water and put the lid on. Let it simmer until the onion has softened. 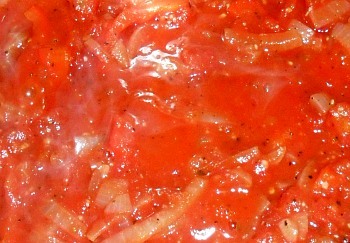 Add the tins of chopped tomatoes and the salt. Bring to the boil and then turn off the heat and put the lid on. Once the pasta is ready, drain off the water - don't worry about the herbs and oil - and add to the sauce. Divide into three lunchboxes and that is all there is to it.